To launch a Skype-based English tutorial service, I got onboard for Manila on July 2007. My flight landed at NAIA, the international airport, which was crowded with long lines in front of immigration. The air-cons weren’t effective enough to cool down the humid air. It smelled exotic. Sour and a bit sweet and fishy. I was alone, for my first visit, without any acquaintance here. “What place should I visit for English tutorials?” I wondered while reading a guidebook. It said “UP, University of the Philippines, known as best university in the Philippines, has its big campus in Quezon City” There might be something there. I booked a hostel inside the campus. They talked to each other for a few minutes. And one of them took out a piece of paper, saying, “This is the map of the campus. This hostel is here. And this is International Center. How about going there?” “Thank you, I’ll go there.” They kindly instructed me how to get there. Just one ride of a jeepney called “Ikot”. A jeepney was familiar to me because of the guidebook. It is a long vehicle, carrying passengers like a bus. I took the ride “Ikot.” Easy to get onboard. Seven pesos as fare. My seven pesos was passed from hand to hand until it reached the driver. The jeepney started to run. Ran, ran, ran; turning right, left, right. I got lost trying to keep track from where I came from. From the window, I couldn’t see any sign of a jeepney stop. Ran, turned left, ran. Finally, the jeepney “Ikot” came back to the original stop, just in front of the hostel. I got off to take a walk to the International Center. After walking for 20 minutes, I got to the International Center. A guard was standing at the entrance, armed with a gun on his waist. “Can I go in?” He let me write my name in a notebook. 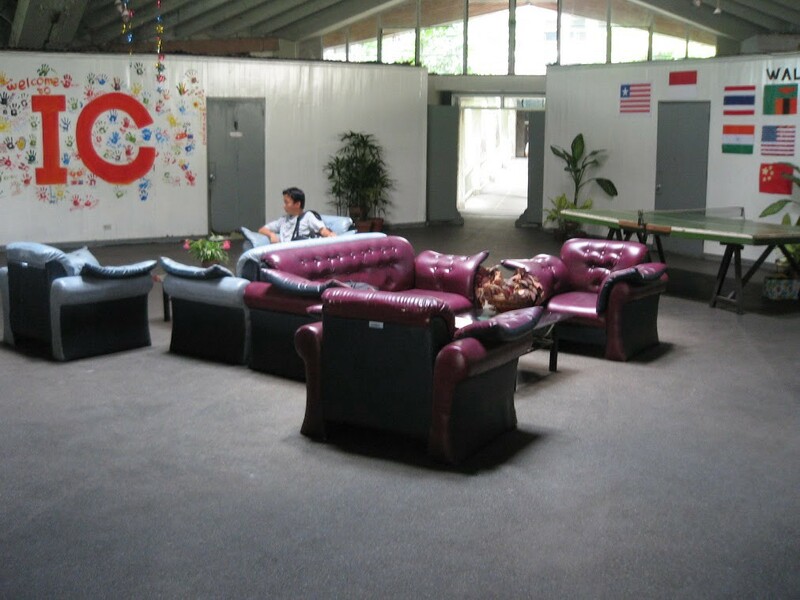 “What is this International Center?” He told me it was an international dormitory for foreign students, studying abroad at UP. I got disappointed a bit. I was looking for Filipinos, not foreigners. Without any clue, I started to look for a trail toward my next step at International Center. This must be the next step! I decided to do the same thing. 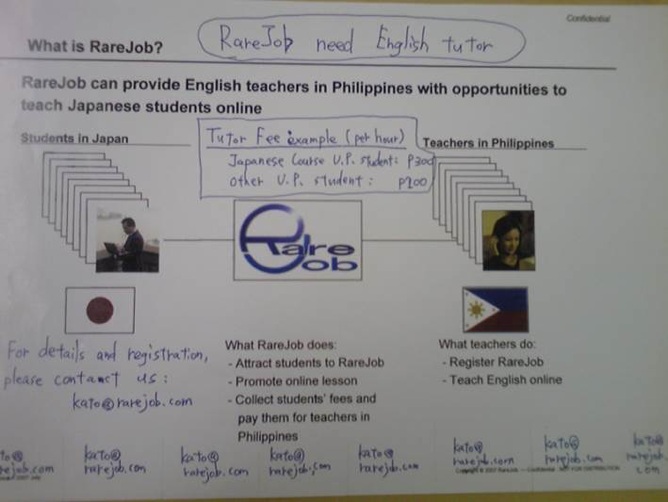 I had brought a one-page presentation from Japan, to verbally explain how the online tutorial would be. To change it into a bulletin for recruitment, I added some of my handwriting, committing some grammar errors. 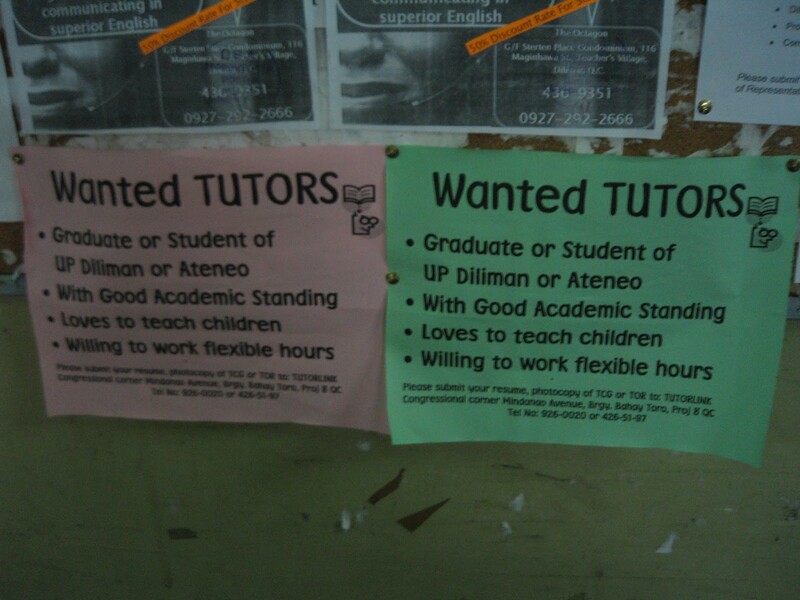 Then I copied them, got approval for posting from UP, then put them around the campus. Having nothing to do anymore, I decided to leave Manila for Banaue. The rice terrace there was overwhelmingly awesome. Then, I went to Internet cafe to check my email. Finding a few inquiries about the post, I replied to them all. In the end, I was able to make an appointment only with one person whose name is Shem. I went back to Manila to see her. Without any hesitation, she said “Yes.” We shook hands. Her friend, Kris, accompanying her, applauded. Then, we went to an Internet cafe to elaborate further how it would work. We went to Trinoma, the nearest mall to UP campus then, to eat dinner. Her friend took a shot of Shem and me. I went back to Japan on following day. She worked on acquiring tutors from her friends. Soon, we realized that the sound quality of the Internet cafe was not enough for online lessons. Shem rented a space and acquired Internet connection under her name, to ensure a tutoring space (and better quality of connection) as soon as possible. I sent the tutors’s fees to her. Starting with a thousands pesos, soon it reached to a hundred thousands pesos. She didn’t pilfer any centavo. Shem did her job alone there for 6 months, until I visited Philippines again. Luckily, in the lowly-reproducible way, I’ve gotten a business partner who had a grit in the area of zero to one. No Shem, No RareJob.